SVERT reported that a thermal anomaly over Snow, a volcano of Chirpoi, was detected in satellite images on 10 August. The Aviation Color Code remained at Yellow. The first recorded eruption in 30 years at Russia's Chirpoi volcano was initially detected on 11 November 2012 by MODIS infrared satellite data and captured by the MODVOLC thermal alert system. The Sakhalin Volcanic Eruption Response Team (SVERT) reported satellite images that detected thermal anomalies over Snow, a volcanic crater on the S end of Chirpoi Island, beginning on 20 November 2012 (BGVN 38:12), which they interpreted as a possible lava flow on the SE flank. Sparse satellite observations by SVERT, MIROVA and MODVOLC thermal anomaly information, a single report from the Tokyo Volcanic Ash Advisory Center (VAAC), and a site visit to this remote location in the Kuril Islands in the western Pacific Ocean together suggest nearly continuous activity at Snow through mid-October 2016. Activity during November 2012-April 2013. Continuous reports of activity between November 2012 and April 2013 began with strong MODVOLC thermal anomalies from MODIS satellite data first recorded on 11 November local time, followed by a report of thermal anomalies detected from SVERT on 20 November. Strong thermal anomalies were reported by MODVOLC for 12 days during November and nine days during December 2012, after which they did not appear again until July 2013. However, SVERT reported thermal anomalies in satellite data almost weekly through 26 April 2013. They also observed steam-and-gas emissions in satellite data a number of times between 15 December 2012 and 5 March 2013. Activity during July 2013-June 2014. After about a 10 week break between thermal anomaly observations, the MODVOLC pixels reappeared on 8 July 2013, and SVERT reported a thermal anomaly on 14 July 2013 suggesting a new period of lava effusion. The MODVOLC anomalies were intermittent with only three in July, one each in August and September, and two in October 2013; they then disappeared until March 2014. A single MODVOLC thermal anomaly was recorded on 10 March 2014, one appeared on 2 June and two appeared on 25 June 2014. SVERT reported anomalies twice in July 2013, three times in August and once on 1 September before picking up again in November. SVERT reported thermal anomalies every week in November 2013, and most weeks through the first week in May 2014. After weak anomalies during 2-4 June 2014, SVERT inferred cooling lava flows and lowered the Alert Level from Yellow to Green. Steam-and-gas emissions were reported by SVERT only between 23 July and 12 August 2013, and not again until late October. Gas-and-steam emissions were common between 22 October and 25 November 2013 when a plume was observed in satellite imagery drifting 90 km SE, after which plumes were not observed until 15 March 2014. Twice in late March (20 and 27) steam-and-gas plumes were detected drifting SE (150 and 50 km). After 13 April 2014, plumes were not detected again until September. Activity during August 2014-October 2016. Although SVERT kept the Alert Level at Green until 4 September 2014 when they raised it back to Yellow, MODVOLC thermal alert pixels in late June (two on the 25th) and on 10 August, suggest possible continued activity during the summer. When skies were clear, SVERT again detected thermal anomalies in satellite data beginning on 1 September 2014 and continuing most weeks until 8 June 2015. MODVOLC recorded thermal anomalies on 2 and 22 September, and 22 October 2014, but then was quiet until a strong signal reappeared in April 2015 with six days of multiple anomalies recorded during the month, and five days with anomalies in May. During this interval from September 2014 to June 2015, steam-and-gas plumes were reported twice each in September 2014, February, March, and April 2015, and on 25 May 2015. While no data is available from SVERT between 9 June and 11 November 2015, the Aviation Color Code remained at Yellow, and single MODVOLC thermal alert pixels were recorded on 28 June, 19 and 30 July, two on 7 September, and one each on 5 October, 3 November, and 19 November 2015, suggesting some type of continued heat source such as a lava flow. In addition, MIROVA records for 2015 provide the strongest evidence for ongoing low-to-moderate volcanic activity throughout 2015 (figure 2). Figure 2. Chirpoi thermal anomaly information from MIROVA for 2 Feb 2015 through 31 December 2016 showing Log Radiative Power measured from MODIS infrared satellite data. Continuous thermal anomalies throughout the period suggest an ongoing heat source such as a lava flows. Vertical axis VRP is Volcanic Radiative Power. Courtesy of MIROVA. Visual confirmation of an effusive eruption at Chirpoi was made in October 2015. The website Volcano Discovery reported that "Passengers on board a Russian cruise ship (Ponant) documented the recent … eruption of Snow volcano. When passing the island in October 2015, lava flows were actively reaching the sea, creating spectacular littoral explosions." (figure 3). A video of the event from the cruise ship is also posted on the website. Figure 3. Explosion of steam and rock fragments as lava from Snow volcano on Chirpoi Island enters the sea. Taken by a passenger on the Russian cruise ship Ponant, 8 October 2015. See complete video for additional imagery. Courtesy of Volcano Discovery, 2015. SVERT reports were available again beginning in November 2015 and they reported that satellite images revealed thermal anomalies almost weekly from 11 November through 10 August 2016. They lowered the Alert Level to Green on 29 August 2016. MODVOLC thermal anomaly data was sparse in 2016 with only three reports of single anomalies on 5 February, 20 May, and 12 June 2016. Reports of steam-and-gas plumes observed in satellite imagery from SVERT were made on 12 and 14 November 2015, 24 March, and 20 and 23 April 2016. A plume that may have contained minor ash was observed by SVERT in satellite data drifting SW on 16 July, and one drifting 90 km N was noted during 22-24 July. The Tokyo VAAC reported a possible eruption observed on satellite imagery at 1300 UTM on 6 March 2016 with a plume rising to 6.1 km altitude and drifting E. MIROVA data for 2016 again seems to confirm ongoing low to moderate thermally anomalous activity at Chirpoi until the middle of October when Radiative Power levels drop below 0.5 Watts VRP (figure 2). Information Contacts: Sakhalin Volcanic Eruption Response Team (SVERT), Institute of Marine Geology and Geophysics, Far Eastern Branch, Russian Academy of Science, Nauki st., 1B, Yuzhno-Sakhalinsk, Russia, 693022 (URL: http://www.imgg.ru/en/, http://www.imgg.ru/ru/svert/reports/); Hawai'i Institute of Geophysics and Planetology (HIGP), MODVOLC Thermal Alerts System, School of Ocean and Earth Science and Technology (SOEST), Univ. of Hawai'i, 2525 Correa Road, Honolulu, HI 96822, USA (URL: http://modis.higp.hawaii.edu/, http://modis.higp.hawaii.edu/cgi-bin/modisnew.cgi); MIROVA (Middle InfraRed Observation of Volcanic Activity), a collaborative project between the Universities of Turin and Florence (Italy) supported by the Centre for Volcanic Risk of the Italian Civil Protection Department (URL: http://www.mirovaweb.it/); Volcano Discovery (URL: http://www.volcanodiscovery.com/chirpoi/news/55254/Chirpoi-volcano-Kurile-Islands-Russia-video-of-lava-entering-the-sea.html); Tokyo Volcanic Ash Advisory Center (VAAC), Tokyo, Japan (URL: http://ds.data.jma.go.jp/svd/vaac/data/). SVERT reported that a thermal anomaly over Snow, a volcano of Chirpoi, was detected in satellite images during 6-7 August. The Aviation Color Code remained at Yellow. SVERT reported that a thermal anomaly over Snow, a volcano of Chirpoi, was detected in satellite images during 27-28 and 31 July. The Aviation Color Code remained at Yellow. SVERT reported that a thermal anomaly over Snow, a volcano of Chirpoi, was detected in satellite images during 18 and 20-24 July. Steam-and-gas emissions were visible drifting SW on 16 July and may have contained minor amounts of ash. Steam-and-gas emissions during 22-24 July drifted as far as 90 km N. The Aviation Color Code remained at Yellow. SVERT reported that a thermal anomaly over Snow, a volcano of Chirpoi, was detected in satellite images on 13 July. The Aviation Color Code remained at Yellow. SVERT reported that a thermal anomaly over Snow, a volcano of Chirpoi, was detected in satellite images during 5-7 July. The Aviation Color Code remained at Yellow. SVERT reported that a thermal anomaly at Snow, a volcano of Chirpoi, was detected in satellite images during 29-30 June and on 1 July. The Aviation Color Code remained at Yellow. SVERT reported that a thermal anomaly over Snow, a volcano of Chirpoi, was detected in satellite images during 20 and 22-23 June. The Aviation Color Code remained at Yellow. SVERT reported that a thermal anomaly over Snow, a volcano of Chirpoi, was detected in satellite images on 19 June. The Aviation Color Code remained at Yellow. SVERT reported that a thermal anomaly over Snow, a volcano of Chirpoi, was detected in satellite images during 7-8 and 12 June. The Aviation Color Code remained at Yellow. SVERT reported that a weak thermal anomaly over Snow, a volcano of Chirpoi, was detected in satellite images during 9-11 and 14 May. The Aviation Color Code remained at Yellow. SVERT reported that a thermal anomaly over Snow, a volcano of Chirpoi, was detected in satellite images on 2 and 5 May. The Aviation Color Code remained at Yellow. SVERT reported that a thermal anomaly over Snow, a volcano of Chirpoi, was detected in satellite images on 20 April; gas-and-steam plumes were visible in images on 20 and 23 April. The Aviation Color Code remained at Yellow. SVERT reported that satellite images detected a thermal anomaly over Snow, a volcano of Chirpoi, during 4-5 and 7 April. The Aviation Color Code remained at Yellow. SVERT reported that satellite images detected a thermal anomaly over Snow, a volcano of Chirpoi, during 29-30 March and 1 April. The Aviation Color Code remained at Yellow. SVERT reported that satellite images detected a thermal anomaly over Snow, a volcano of Chirpoi, during 21-25 and 27 March. Steam-and-gas emissions were observed on 24 March. The Aviation Color Code remained at Yellow. SVERT reported that satellite images detected a thermal anomaly over Snow, a volcano of Chirpoi, on 14, 17, and 19 March. The Aviation Color Code remained at Yellow. Based on satellite images, the Tokyo VAAC reported that on 6 March a possible eruption at Chirpoi may have produced an ash plume that rose to an altitude of 6.1 km (20,000 ft) a.s.l. and drifted E. A subsequent image the next day showed that any ash had dissipated. SVERT reported that satellite images detected a thermal anomaly over Snow, a volcano of Chirpoi, during 16-19 February. The Aviation Color Code remained at Yellow. SVERT reported that satellite images detected a thermal anomaly over Snow, a volcano of Chirpoi, on 8 and 11 February. The Aviation Color Code remained at Yellow. SVERT reported that satellite images detected a thermal anomaly over Snow, a volcano of Chirpoi, during 25, 27-28, and 30-31 January. The Aviation Color Code remained at Yellow. SVERT reported that satellite images detected a thermal anomaly over Snow, a volcano of Chirpoi, on 18 and 23 January. The Aviation Color Code remained at Yellow. SVERT reported that satellite images detected a thermal anomaly over Snow, a volcano of Chirpoi, during 12-13 and 17 January. The Aviation Color Code remained at Yellow. SVERT reported that satellite images detected a thermal anomaly over Snow, a volcano of Chirpoi, on 9 January. The Aviation Color Code remained at Yellow. SVERT reported that satellite images detected a thermal anomaly over Snow, a volcano of Chirpoi, during 28-29 December and 2 January. The Aviation Color Code remained at Yellow. SVERT reported that satellite images detected a weak thermal anomaly over Snow, a volcano of Chirpoi, during 21-23 and 27 December. The Aviation Color Code remained at Yellow. SVERT reported that satellite images over Snow, a volcano of Chirpoi, revealed a thermal anomaly during 1-3 and 6 December. The Aviation Color Code remained at Yellow. SVERT reported that satellite images over Snow, a volcano of Chirpoi, detected a thermal anomaly on 17 and 19 November. Cloud cover prevented views of the volcano on the other days during 16-23 November. The Aviation Color Code remained at Yellow. SVERT reported that satellite images over Snow, a volcano of Chirpoi, detected a thermal anomaly during 11-12 and 15 November. Steam-and-gas emissions were also observed on 12 and 14 November. The Aviation Color Code remained at Yellow. SVERT reported that satellite images over Snow, a volcano of Chirpoi, detected a thermal anomaly during 1-2 June. Cloud cover obscured views during 3-8 June. The Aviation Color Code remained at Yellow. SVERT reported that satellite images over Snow, a volcano of Chirpoi, detected weak steam-and-gas emissions on 25 May. A thermal anomaly was detected on 25, 28, and 30 May. Cloud cover obscured views on other days during 26 May-1 June. The Aviation Color Code remained at Yellow. SVERT reported that satellite images over Snow, a volcano of Chirpoi, detected a thermal anomaly on 12 and 16 May. Cloud cover obscured views on other days during 13-18 May. The Aviation Color Code remained at Yellow. SVERT reported that satellite images over Snow, a volcano of Chirpoi, detected a thermal anomaly during 6-8 and 11 May. Cloud cover obscured views on other days during 4-11 May. The Aviation Color Code remained at Yellow. SVERT reported that satellite images over Snow, a volcano of Chirpoi, showed a thermal anomaly on 28 and 30 April, and 1 May. Cloud cover obscured views on other days during 27 April-4 May. The Aviation Color Code remained at Yellow. SVERT reported that satellite images over Snow, a volcano of Chirpoi, detected steam-and-gas emissions on 20 April. Cloud cover obscured views during 21-27 April. The Aviation Color Code remained at Yellow. SVERT reported that satellite images over Snow, a volcano of Chirpoi, detected a thermal anomaly on 14 and 17 April. Weak steam-and-gas emissions were also observed on 17 April. Cloud cover obscured views on other days during 13-20 April. The Aviation Color Code remained at Yellow. SVERT reported that satellite images over Snow, a volcano of Chirpoi, detected a thermal anomaly during 8-11 April. Cloud cover obscured views on other days during 7-13 April. The Aviation Color Code remained at Yellow. SVERT reported that satellite images over Snow, a volcano of Chirpoi, detected a thermal anomaly during 2 and 4-5 April. Cloud cover obscured views on other days during 31 March-6 April. The Aviation Color Code remained at Yellow. SVERT reported that satellite images over Snow, a volcano of Chirpoi, detected a thermal anomaly during 26-27 March, and gas-and-steam emissions on 29 March. Cloud cover obscured views on other days during 23-30 March. The Aviation Color Code remained at Yellow. SVERT reported that satellite images over Snow, a volcano of Chirpoi, showed faint stream-and-gas emissions on 16 March and a thermal anomaly during 17-20 March. Cloud cover obscured views on other days during 21-23 March. The Aviation Color Code remained at Yellow. SVERT reported that satellite images over Snow, a volcano of Chirpoi, showed a thermal anomaly during 9, 14, and 15 March. Cloud cover obscured views on other days during 9-16 March. The Aviation Color Code remained at Yellow. SVERT reported that satellite images over Snow, a volcano of Chirpoi, showed a thermal anomaly during 3-5 and 7-8 March. Cloud cover obscured views on other days during 2-9 March. The Aviation Color Code remained at Yellow. SVERT reported that satellite images over Snow, a volcano of Chirpoi, showed gas-and-steam emissions on 23 February and a thermal anomaly on 23 and 25 February. Cloud cover obscured views on other days during 23 February-2 March. The Aviation Color Code remained at Yellow. SVERT reported that satellite images over Snow, a volcano of Chirpoi, showed gas-and-steam emissions on 19 February and a thermal anomaly on 21 February. Cloud cover obscured views on other days during 16-23 February. The Aviation Color Code remained at Yellow. SVERT reported that satellite images over Snow, a volcano of Chirpoi, showed a thermal anomaly on 9 and 11 February. Cloud cover obscured views during 10 and 12-16 February. The Aviation Color Code remained at Yellow. SVERT reported that satellite images over Snow, a volcano of Chirpoi, showed a weak thermal anomaly on 26 January. Cloud cover obscured views during 27 January-2 February. The Aviation Color Code remained at Yellow. SVERT reported that satellite images over Snow, a volcano of Chirpoi, showed a thermal anomaly during 20-21 and 25 January. Cloud cover obscured views on other days during 19-26 January. The Aviation Color Code remained at Yellow. SVERT reported that satellite images over Snow, a volcano of Chirpoi, showed a thermal anomaly during 10-11 January. Cloud cover obscured views on other days during 5-12 January. The Aviation Color Code remained at Yellow. SVERT reported that satellite images over Snow, a volcano of Chirpoi, showed a thermal anomaly on 4 January. Cloud cover obscured views on other days during 30 December-5 January. The Aviation Color Code remained at Yellow. SVERT reported that satellite images over Snow, a volcano of Chirpoi, showed a thermal anomaly on 23 and 25 December. Cloud cover obscured views on other days during 22-29 December. The Aviation Color Code remained at Yellow. SVERT reported that satellite images over Snow, a volcano of Chirpoi, showed a thermal anomaly during 8-14 December. The Aviation Color Code remained at Yellow. SVERT reported that satellite images over Snow, a volcano of Chirpoi, showed a thermal anomaly during 2-5 December. Cloud cover obscured views on other days during 1-8 December. The Aviation Color Code remained at Yellow. SVERT reported that satellite images over Snow, a volcano of Chirpoi, showed a thermal anomaly on 27 November. Cloud cover obscured views on other days during 25 November-1 December. The Aviation Color Code remained at Yellow. SVERT reported that satellite images over Snow, a volcano of Chirpoi, showed a weak thermal anomaly during 17-18 November. Cloud cover obscured views on other days during 19-24 November. The Aviation Color Code remained at Yellow. SVERT reported that satellite images over Snow, a volcano of Chirpoi, showed a weak thermal anomaly on 16 November. Cloud cover obscured views on other days during 11-17 November. The Aviation Color Code remained at Yellow. SVERT reported that satellite images over Snow, a volcano of Chirpoi, showed a thermal anomaly during 15-16 October. Cloud cover obscured views on other days during 14-20 October. The Aviation Color Code remained at Yellow. SVERT reported that satellite images over Snow, a volcano of Chirpoi, showed a thermal anomaly on 6, 9, and 12 October. Cloud cover obscured views on other days during 7-13 October. The Aviation Color Code remained at Yellow. During 1 to 16 September thermal anomalies were detected from Chirpoi in satellite images when clear conditions permitted. On 4 September SVERT increased the Aviation Color Code from Green to Yellow due to renewed activity including thermal anomalies. Gas-and-steam plumes were visible on 11 and 15-16 September. In a 5 June report, SVERT summarized activity at Snow, a volcano of Chirpoi, over the previous two years: an effusive eruption started on 10 November 2012, producing steam-and-gas emissions and thermal anomalies thorough April 2013; the volcano was quiet; steam-and-gas emissions and thermal anomalies were again detected starting on 12 July 2013, suggesting a new period of lava effusion. Weak thermal anomalies during 2-4 June implied cooling lava flows. The Aviation Color Code was lowered to Green. SVERT reported that satellite images over Snow, a volcano of Chirpoi, detected a thermal anomaly on 7 and 9 May. Cloud cover obscured views on other days during 5-12 May. The Aviation Color Code remained at Yellow. SVERT reported that satellite images over Snow, a volcano of Chirpoi, detected a thermal anomaly during 29-30 April. Cloud cover obscured views during 1-5 May. The Aviation Color Code remained at Yellow. SVERT reported that satellite images over Snow, a volcano of Chirpoi, detected a thermal anomaly on 21 and 27 April. Cloud cover obscured views on the other days during 22-28 April. The Aviation Color Code remained at Yellow. SVERT reported that satellite images over Snow, a volcano of Chirpoi, detected a thermal anomaly on 14, 16, and 18 April. Cloud cover obscured views on the other days during 15-21 April. The Aviation Color Code remained at Yellow. SVERT reported that on 13 April satellite images over Snow, a volcano of Chirpoi, detected steam-and-gas emissions. Cloud cover obscured views on the other days during 9-15 April. The Aviation Color Code remained at Yellow. SVERT reported that on 27 March satellite images over Snow, a volcano of Chirpoi, detected a thermal anomaly and a steam-and-gas plume drifting more than 50 km SE. A weak thermal anomaly was detected on 28 March. Cloud cover obscured views on the other days during 24-31 March. The Aviation Color Code remained at Yellow. SVERT reported that a steam-and-gas plume from Snow, a volcano of Chirpoi, was detected in satellite images drifting 150 km SE on 20 March. Cloud cover obscured views during 17-19 and 21-24 March. The Aviation Color Code remained at Yellow. SVERT reported that a thermal anomaly over Snow, a volcano of Chirpoi, was detected in satellite images during 10-12 March. Diffuse steam-and-gas emissions were observed on 15 March. Cloud cover obscured views during 13-14 and 16-17 March. The Aviation Color Code remained at Yellow. SVERT reported that a thermal anomaly over Snow, a volcano of Chirpoi, was detected in satellite images on 3 March. Cloud cover obscured views during 4-10 March. The Aviation Color Code remained at Yellow. SVERT reported that a thermal anomaly over Snow, a volcano of Chirpoi, was detected in satellite images on 25 and 27 February. Cloud cover obscured views on the other days during 24 February-3 March. The Aviation Color Code remained at Yellow. SVERT reported that a thermal anomaly over Snow, a volcano of Chirpoi, was detected in satellite images during 19-20 February. Cloud cover obscured views on the other days during 17-24 February. The Aviation Color Code remained at Yellow. SVERT reported that a thermal anomaly over Snow, a volcano of Chirpoi, was detected in satellite images during 11-12 February. Cloud cover obscured views during 13-17 February. The Aviation Color Code remained at Yellow. SVERT reported that a thermal anomaly over Snow, a volcano of Chirpoi, was detected in satellite images during 6 and 8-9 February. Cloud cover obscured views on other days during 4-10 February. The Aviation Color Code remained at Yellow. SVERT reported that a thermal anomaly over Snow, a volcano of Chirpoi, was detected in satellite images during 21-23 January. Cloud cover obscured views during 24-27 January. The Aviation Color Code remained at Yellow. SVERT reported that a thermal anomaly over Snow, a volcano of Chirpoi, was detected in satellite images during 15-16 January. Cloud cover obscured views on the other days during 14-20 January. The Aviation Color Code remained at Yellow. SVERT reported that a thermal anomaly over Snow, a volcano of Chirpoi, was detected in satellite images on 26 December. Cloud cover obscured views on the other days during 23-30 December. The Aviation Color Code remained at Yellow. SVERT reported that a thermal anomaly over Snow, a volcano of Chirpoi, was detected in satellite images during 12-13 and 15 December. Cloud cover obscured views on the other days during 10-16 December. The Aviation Color Code remained at Yellow. SVERT reported that a thermal anomaly over Snow, a volcano of Chirpoi, was detected in satellite images on 3 and 8 December. The Aviation Color Code remained at Yellow. SVERT reported that steam-and-gas emissions from Snow, a volcano of Chirpoi, were detected in satellite images drifting 90 km SE on 25 November. A thermal anomaly was detected during 27-28 November. The Aviation Color Code remained at Yellow. SVERT reported that a thermal anomaly from Snow, a volcano of Chirpoi, was detected in satellite images on 21 and 24 November. The Aviation Color Code remained at Yellow. SVERT reported that a thermal anomaly from Snow, a volcano of Chirpoi, was detected in satellite images during 13-15 November. The Aviation Color Code remained at Yellow. SVERT reported that a thermal anomaly from Snow, a volcano of Chirpoi, was detected in satellite images during 4-6 November. Weak steam-and-gas emissions were detected on 4 and 6 November. The Aviation Color Code remained at Yellow. SVERT reported that steam-and-gas emissions from Snow, a volcano of Chirpoi, were detected in satellite images during 29 and 31 October. A thermal anomaly was detected during 2 and 3 November. The Aviation Color Code remained at Yellow. SVERT reported that steam-and-gas emissions from Snow, a volcano of Chirpoi, were detected in satellite images during 22-23 October. The Aviation Color Code remained at Yellow. SVERT reported that a thermal anomaly from Snow, a volcano of Chirpoi, was detected in satellite images on 1 September. The Aviation Color Code remained at Yellow. SVERT reported that a thermal anomaly from Snow, a volcano of Chirpoi, was detected in satellite images on 12 August, along with gas-and-steam emissions. Cloud cover prevented observations during 13-18 August. The Aviation Color Code remained at Yellow. SVERT reported that a thermal anomaly over Snow, a volcano of Chirpoi, was detected in satellite images during 5-7 and 9 August, and possibly during 10-11 August. Steam-and-gas emissions were detected on 9 August. The Aviation Color Code remained at Yellow. SVERT reported that possible steam-and-gas emissions from Snow, a volcano of Chirpoi, were detected in satellite images on 23 July. The Aviation Color Code remained at Yellow. SVERT reported that a thermal anomaly over Snow, a volcano of Chirpoi, was detected in satellite images on 14 July. The Aviation Color Code remained at Yellow. SVERT reported that a weak thermal anomaly over Snow, a volcano of Chirpoi, was detected in satellite images on 24 and 26 April. SVERT reported that a weak thermal anomaly over Snow, a volcano of Chirpoi, was detected in satellite images during 12-13 April; cloud cover prevented observations of the volcano on other days during 8-15 April. SVERT reported that a weak thermal anomaly over Snow, a volcano of Chirpoi, was detected in satellite images on 6 April; cloud cover prevented observations of the volcano on other days during 1-8 April. SVERT reported that a weak thermal anomaly over Snow, a volcano of Chirpoi, was detected in satellite images on 14 March; cloud cover prevented observations of the volcano on other days during 11-18 March. SVERT reported that steam-and-gas emissions from Snow, a volcano of Chirpoi, were detected in satellite images on 5 March; cloud cover prevented observations of the volcano on other days during 4-11 March. SVERT reported that weak steam-and-gas emissions from Snow, a volcano of Chirpoi, were observed on 25 February, and 1 and 3 March. A thermal anomaly was detected in satellite images on 28 February and 3 March. Cloud cover prevented observations of the volcano on other days during 25 February-4 March. The Aviation Color Code was Yellow. SVERT reported that a thermal anomaly and weak steam-and-gas emissions from Snow, a volcano of Chirpoi, were detected in satellite images during 19 and 22-23 February; cloud cover prevented observations of the volcano on other days during 18-25 February. The Aviation Color Code was Yellow. SVERT reported that a thermal anomaly and weak steam-and-gas emissions from Snow, a volcano of Chirpoi, were detected in satellite images during 14-15 February; cloud cover prevented observations of the volcano on other days during 11-18 February. The Aviation Color Code was Yellow. SVERT reported that a thermal anomaly and steam-and-gas emissions from Snow, a volcano of Chirpoi, were detected in satellite images on 7 and 10 February; cloud cover prevented observations of the volcano on other days during 4-11 February. SVERT reported that steam-and-gas emissions from Snow, a volcano of Chirpoi, were detected in satellite images on 1 February; cloud cover prevented observations of the volcano on other days during 28 January-4 February. SVERT reported that a thermal anomaly and steam-and-gas emissions from Snow, a volcano of Chirpoi, on 8 January, were detected on 21, 23, and 25 January; cloud cover prevented observations of the volcano on other days during 22-28 January. SVERT reported that a thermal anomaly was detected over Snow, a volcano of Chirpoi, on 8 January, and steam-and-gas plumes were detected on 9 and 11 January; cloud cover prevented observations of the volcano on other days during 7-14 January. SVERT reported that a thermal anomaly was detected over Snow, a volcano of Chirpoi, during 5-6 January; cloud cover prevented observations of the volcano on other days during 1-7 January. SVERT reported that a thermal anomaly was detected over Snow, a volcano of Chirpoi, during 24-25, 28, and 30 December; cloud cover prevented observations of the volcano on other days during 24-31 December. SVERT reported that a thermal anomaly was detected over Snow, a volcano of Chirpoi, during 17, 19, and 21-22 December. A steam-and-gas plume was observed on 19 December. Cloud cover prevented observations of the volcano on the other days during 10-17 December. SVERT reported that a thermal anomaly was detected over Snow, a volcano of Chirpoi, during 11 and 13-15 December. A steam-and-gas plume was observed on 15 December. Cloud cover prevented observations of the volcano on other days during 10-17 December. SVERT reported that a thermal anomaly was detected over Snow, a volcano of Chirpoi, during 3-4, 6, and 8 December; cloud cover prevented observations of the volcano on other days during 2-10 December. SVERT reported that a thermal anomaly was detected over Snow, a volcano of Chirpoi, during 26-28 November; cloud cover prevented observations of the volcano on other days during 29 November-2 December. SVERT reported that a thermal anomaly was detected over Snow, a volcano of Chirpoi, on 20, 22, and 25 November, possibly indicating a lava flow on the SE flank. On 22 November 1982 a ship captain saw heavy smoke clouds above the crater of a 395-m peak on the island. Investigation showed that a brief eruption had occurred from Snow volcano. Reference. Ivanov, B.V., Chirkov, A.M., Dubik, Yu. M., Khrenov, A.P., Dvigalo, V.N., Razina, A.A., Stepanov, V.V., and Chubarova, O.S., 1988, Active volcanoes of Kamchatka and Kurile Islands: status in 1982: Volcanology and Seismology, v. 6, p. 623-634 (English translation of paper in Volcanology and Seismology, 1984, no. 4, p. 104-110). Weak fumarolic activity was occurring from the crater of Snow volcano during a 6 November aerial survey. Information Contacts: G. Steinberg and B. Piskunov, Yuzhno-Sakhalinsk. On 6 November 1986, weak fumarolic activity was observed during an aerial survey (SEAN 12:04). 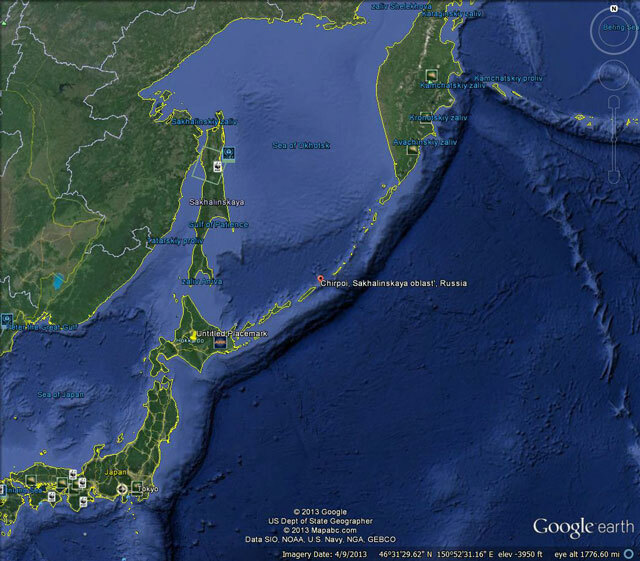 The Sakhalin Volcanic Eruption Response Team (SVERT) noted that emissions were again observed in November 2012. This report covers steam-and-gas plumes and emissions and thermal alerts between 20 November 2012 and 30 April 2014. SVERT's monitoring of Chirpoi is hampered by the lack of surface instruments or seismic network. The volcano is primarily monitored by satellites; cloud cover, however, often prevents space-borne observations. The location of Chirpoi in the Kuril Islands is shown in figure 1. Figure 1. Map showing location of Chirpoi. Courtesy of Google Earth. SVERT reported thermal anomalies at a volcano of Chirpoi called Snow, starting on 17 November 2012. Periods of steam-and-gas began on 15 December 2012. This activity continued through at least April 2014, based upon analysis of satellite images (table 1). Cloud cover often obscured views of the volcano. Table 1. Steam-and-gas plumes and emissions from Snow, a Chirpoi volcano, between 21 November 2012 and 30 April 2014, based on analysis of satellite images. Cloud cover frequently prevented observations. Courtesy of SVERT. A search of MODVOLC thermal alerts at Chirpoi since 1980 found no such alerts until a they began at Snow on 11 November 2012. Between that date and 24 December 2012, many thermal alerts were reported. According to SVERT, this may have indicated a lava flow on the SE flank. No further alerts were reported until 8 July 2013; between 8 July and October 2013, thermal alerts were issued on six days. The only alerts between November 2013 and 30 April 2014 were on 10 March, 27-28 March, and 14, 16, 18, 21, 27, 29-30 April 2014. Information Contacts: Sakhalin Volcanic Eruption Response Team (SVERT) (URL in English: http://www.imgg.ru/?id_d=659); and Hawai'i Institute of Geophysics and Planetology (HIGP), MODVOLC Thermal Alerts System, School of Ocean and Earth Science and Technology (SOEST), Univ. of Hawai'i, 2525 Correa Road, Honolulu, HI 96822, USA (URL: http://modis.higp.hawaii.edu/). Chirpoi, a small island lying between the larger islands of Simushir and Urup, contains a half dozen volcanic edifices constructed within an 8-9 km wide, partially submerged caldera. The southern rim of the caldera is exposed on nearby Brat Chirpoev Island. 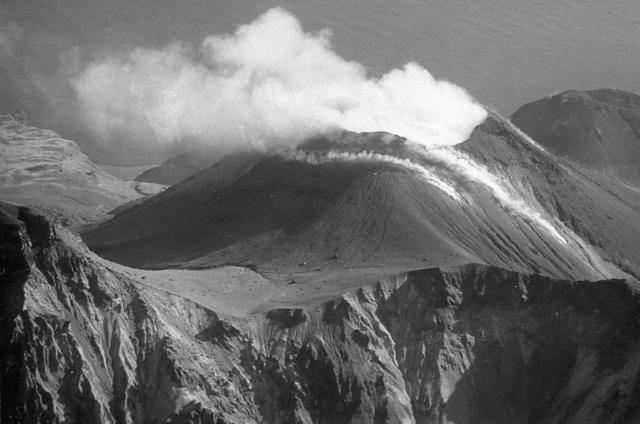 The symmetrical Cherny volcano, which forms the central cone of the island, erupted twice during the 18th and 19th centuries. The youngest volcano, Snow, originated between 1770 and 1810. It is composed almost entirely of lava flows, many of which have reached the sea on the southern coast. No historical eruptions are known from Brat Chirpoev, but its youthful morphology suggests recent strombolian activity. Gorshkov G S, 1958. Kurile Islands. Catalog of Active Volcanoes of the World and Solfatara Fields, Rome: IAVCEI, 7: 1-99. There is data available for 9 Holocene eruptive periods. There is no Deformation History data available for Chirpoi. There is no Emissions History data available for Chirpoi. Chirpoi Island contains a half dozen volcanic edifices constructed within an 8-9 km wide, partially submerged caldera. This view from the east shows Snow volcano (left), symmetrical Cherny volcano (center), and eroded Chirpoi volcano (right). Cherny volcano, capped by a well-preserved crater, has erupted twice during the 18th and 19th centuries. Snow volcano originated between 1770 and 1810. It is composed almost entirely of lava flows, some of which form the shoreline in the foreground. Steam clouds rise from the summit crater and fumarolic vents on the upper flanks of Cherny volcano in October 1990. The smooth-sloped cone of Cherny, seen here from the NW, is truncated by a 330-m-wide crater that displays long-term powerful fumarolic activity. Cherny is one of two volcanic cones on Chirpoi volcano that have been active in historical time. Eruptions took place in 1712 or 1713, 1854 (this may have been from the neighboring Snow lava cone, visible at the upper right), and 1857. 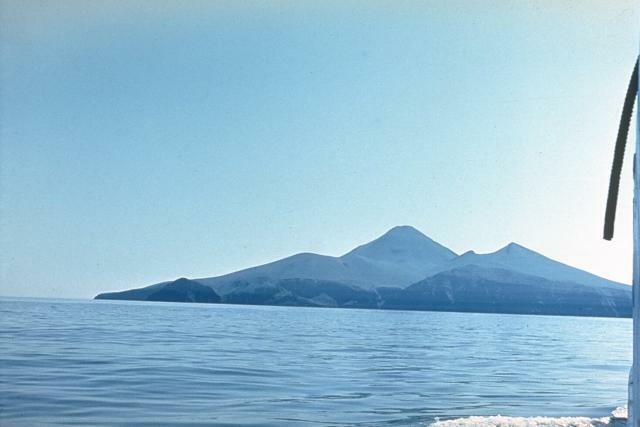 Photo by A. Samoluk, 1990 (courtesy of Genrich Steinberg, Institute of Marine Geology and Geophysics, Yuzhno-Sakhalinsk). There are no samples for Chirpoi in the Smithsonian's NMNH Department of Mineral Sciences Rock and Ore collection. Large Eruptions of Chirpoi Information about large Quaternary eruptions (VEI >= 4) is cataloged in the Large Magnitude Explosive Volcanic Eruptions (LaMEVE) database of the Volcano Global Risk Identification and Analysis Project (VOGRIPA).